I went out to dinner at Sweet Tomatoes the other night and, throwing my low-carb diet to the wind for one night, had some of their Albondigas Locas soup. It was great, so I immediately started thinking of how I could make it myself, the low-carb way. This recipe is the result. It’s not exactly like the restaurant’s version, but it’s just as good. 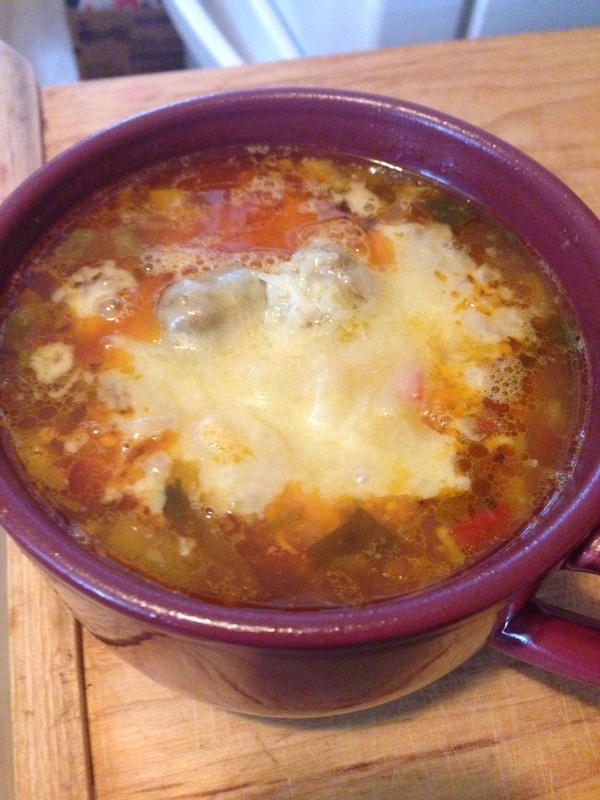 Albondigas is the Spanish word for meatballs, so you will be making meatballs for this soup. You have two options for the meat: follow the recipe using 2 lbs of ground beef (or any other ground meat) and the listed spices, or use 1 lb of plain ground beef and 1 lb of chorizo with the rest of the ingredients, minus the spices. Preheat your oven to 475° and spray two baking trays with non-stick cooking spray. 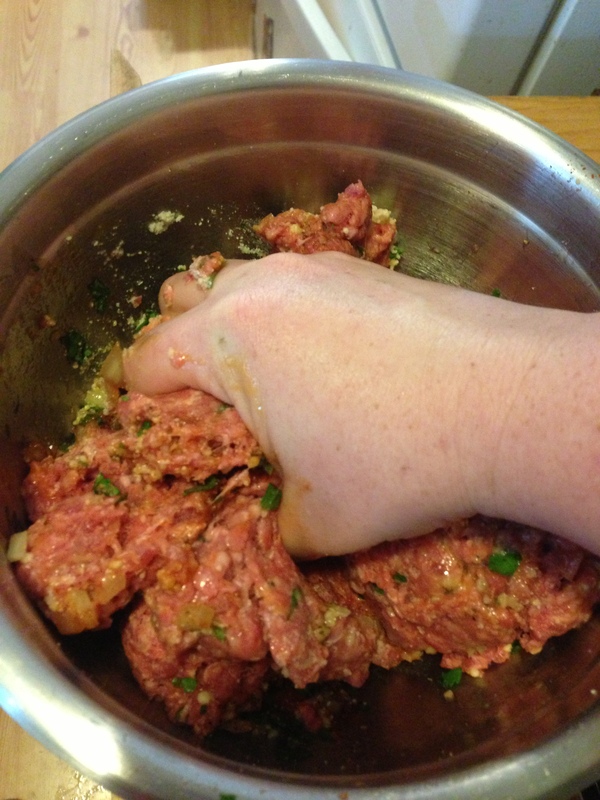 To make the meatballs, put all the meatball ingredients in a bowl and, using your hands, mix them together. Just squish everything between your fingers until they are well combined. Form small meatballs (no larger than 2 cm across, you want them to be able to fit on a spoon) and place them on the baking trays. Bake for 12-15 minutes, until browned. When they are done, remove them from the tray immediately and set them aside. I neglected to remove them from the tray right away, and the fat that had rendered out of the meat solidified and I had to reheat them to get them off the tray without the fat. While the meatballs are baking, saute the onions and bell pepper in your soup pot with a little oil. When the onions are almost translucent, add the garlic and saute for a little while longer. Add the celery, diced tomatoes, water, and chicken and beef bases. Bring to a boil and cook for about 15 minutes. The celery should start to soften but not be completely cooked yet. Add the cauliflower and zucchini. The cauliflower should be about the size of a grain of rice. You can grate it with a cheese grater, or use the pulse on a food processor a few times. Cook for about 10 more minutes. 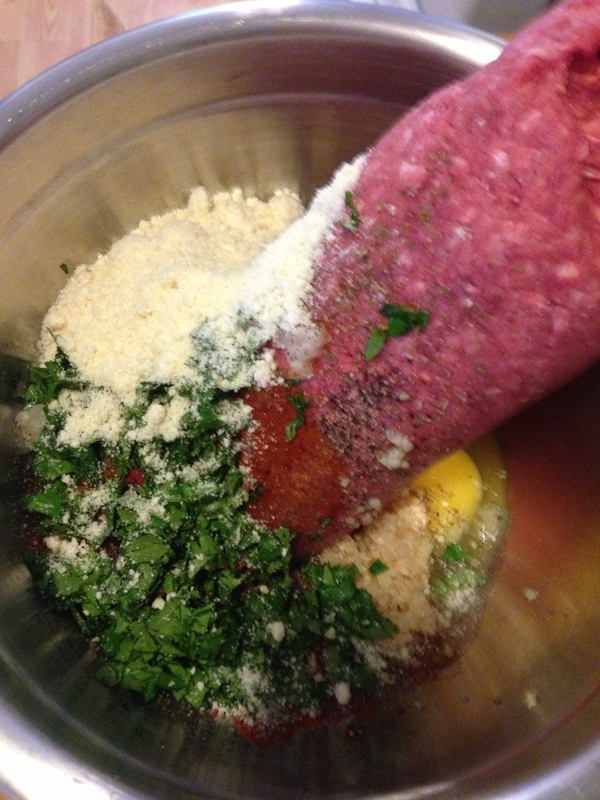 Add in the meatballs, lime juice, and cilantro and cook for another 5 minutes. Feel free to keep some meatballs for a sandwich or to snack on if it seems like there are too many. Taste the broth, and add black pepper and cumin to taste. I ended up only needing about 1/4 tsp each of black pepper and cumin. If the broth doesn’t seem savory enough, add another few teaspoons of chicken or beef base. Mine came out just right, but taste is by no means universal, so do what tastes good to you. Serve the soup in a big bowl with a generous helping of shredded cheese or a spoonful of sour cream. If you split this into 6 portions, which will be generous, it comes to about 450 calories/bowl (not including the cheese/sour cream).